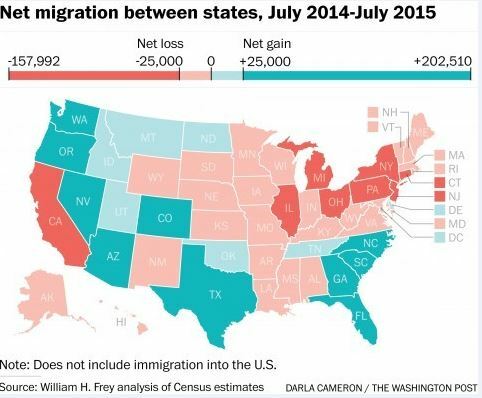 HomeState migration trends: A familiar pattern reasserts itself? ← Ad blocking goes big-time. Call me a conspiracy theorist, but I do believe that this is the political motivation for the lack of border enforcement and the transportation large numbers of unaccompanied minors into certain states. As more entrepreneurs, businesses and individuals interested in lower tax and regulatory burdens move into states like Texas and Arizona, there is unchecked migration of people who seek the aid and comfort of a “benevolent” federal government. These populations would be more likely to advocate for more government spending and “protections.” Amnesty or other legal status would change the political complexion of these states and bring a gradual end to the financial and individual liberties enjoyed there. In an April Supreme Court decision, it was determined that congressional apportionment must be based on total population, including non-citizens. This grants political influence to all who reside in a state — regardless of their eligibility to vote. The beauty of 50 independent states is the liberty of mobility; if one state is a bad social experiment, families and businesses can move. Citizens acting in their own best interest is antagonistic to a powerful central government. This is an interesting but very complicated question.
. Hi-tech companies finding cheap labor in a lower cost-of-living state.
. Retirement “haven” with relatively low taxes and a growing geriatric-medical infrastructure.
. Long-term natural resource legal objectives, such as establishing anti-population case law in poor counties with corrupt judges.
. Concentrate the population in metropolitan areas and get them out of uncontrollable rural land.
. Clear-cut and then strip-mine the rural areas. The drug problem around Oregon also reflects the similarity. I doubt many people will express it that bluntly, but that’s what it is.